1. Express amounts of radioactivity in a variety of units. In Chapter 15 “Nuclear Chemistry”, Section 15.2 “Half-Life”, we used mass to indicate the amount of radioactive substance present. This is only one of several units used to express amounts of radiation. Some units describe the number of radioactive events occurring per unit time, while others express the amount of a person’s exposure to radiation. A sample of radium has an activity of 16.0 mCi (millicuries). If the half-life of radium is 1,600 y, how long before the sample’s activity is 1.0 mCi? Over a period of 4 half-lives, the activity of the radium will be halved four times, at which point its activity will be 1.0 mCi. Thus it takes 4 half-lives, or 4 × 1,600 y = 6,400 y, for the activity to decrease to 1.0 mCi. A sample of radon has an activity of 60,000 Bq. If the half-life of radon is 15 h, how long before the sample’s activity is 3,750 Bq? A sample of radium has an activity of 16.0 mCi. If the half-life of radium is 1,600 y, how long before the sample’s activity is 5.6 mCi? It makes sense that the time is greater than one half-life (1,600 y) because we have less than one-half of the original activity left. A sample of radon has an activity of 60,000 Bq. If the half-life of radon is 15 h, how long before the sample’s activity is 10,000 Bq? Other measures of radioactivity are based on the effects it has on living tissue. Radioactivity can transfer energy to tissues in two ways: through the kinetic energy of the particles hitting the tissue and through the electromagnetic energy of the gamma rays being absorbed by the tissue. Either way, the transferred energy—like the thermal energy from boiling water—can damage the tissue. The rad is more common. To get an idea of the amount of energy this represents, consider that the absorption of 1 rad by 70,000 g of water (approximately the same mass as a 150 lb person) would increase the temperature of the water by only 0.002°C. This may not seem like a lot, but it is enough energy to break about 1 × 1021 molecular C–C bonds in a person’s body. That amount of damage would not be desirable. where factor is a number greater than or equal to 1 that takes into account the type of radioactive emission and sometimes the type of tissue being exposed. For beta particles, the factor equals 1. For alpha particles striking most tissues, the factor is 10, but for eye tissue the factor is 30. Most radioactive emissions that people are exposed to are on the order of a few dozen millirems (mrem) or less; a medical X-ray is about 20 mrem. A sievert (Sv) is a related unit and is defined as 100 rem. What is a person’s annual exposure to radioactivity and radiation? Table 15.3 “Average Annual Radiation Exposure (Approximate)” lists the sources and annual amounts of radiation exposure. It may surprise you to learn that fully 82% of the radioactivity and radiation exposure we receive is from natural sources—sources we cannot avoid. Fully 10% of the exposure comes from our own bodies—largely from carbon-14 and potassium-40. *Flying from New York City to San Francisco adds 5 mrem to your overall radiation exposure because the plane flies above much of the atmosphere, which protects us from cosmic radiation. The actual effects of radioactivity and radiation exposure on a person’s health depend on the type of radioactivity, the length of exposure, and the tissues exposed. Table 15.4 “Effects of Short-Term Exposure to Radioactivity and Radiation” lists the potential threats to health at various amounts of exposure over short periods of time (hours or days). One of the simplest ways of detecting radioactivity is by using a piece of photographic film embedded in a badge or a pen. On a regular basis, the film is developed and checked for exposure. Comparing the exposure level of the film with a set of standard exposures indicates the amount of radiation a person was exposed to. 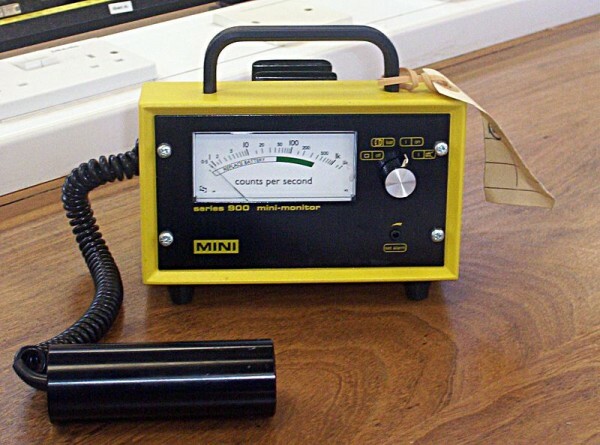 A Geiger counter is a common instrument used to detect radioactivity. Source: “Geiger counter” by Boffy B is licensed under the Creative Commons Attribution-Share Alike 3.0 Unported license. Radioactivity can be expressed in a variety of units, including rems, rads, and curies. How does a becquerel differ from a curie? A sample of radon gas has an activity of 140.0 mCi. If the half-life of radon is 1,500 y, how long before the activity of the sample is 8.75 mCi? A sample of curium has an activity of 1,600 Bq. If the half-life of curium is 24.0 s, how long before its activity is 25.0 Bq? If a radioactive sample has an activity of 65 µCi, how many disintegrations per second are occurring? If a radioactive sample has an activity of 7.55 × 105 Bq, how many disintegrations per second are occurring? A sample of fluorine-20 has an activity of 2.44 mCi. If its half-life is 11.0 s, what is its activity after 50.0 s? Strontium-90 has a half-life of 28.1 y. If 66.7 Bq of pure strontium-90 were allowed to decay for 15.0 y, what would the activity of the remaining strontium-90 be? How long does it take 100.0 mCi of fluorine-20 to decay to 10.0 mCi if its half-life is 11.0 s? Technetium-99 is used in medicine as a source of radiation. A typical dose is 25 mCi. How long does it take for the activity to reduce to 0.100 mCi? The half-life of 99Tc is 210,000 y. Describe how a radiation exposure in rems is determined. Which contributes more to the rems of exposure—alpha or beta particles? Why? Use Table 15.4 “Effects of Short-Term Exposure to Radioactivity and Radiation” to determine which sources of radiation exposure are inescapable and which can be avoided. What percentage of radiation is unavoidable? Name two isotopes that contribute to the radioactivity in our bodies. Explain how a film badge works to detect radiation. Explain how a Geiger counter works to detect radiation. A becquerel is 1 decay/s, whereas a curie is 3.7 × 1010 decays/s. exposure. If exposure to radon gas is added, the total unavoidable exposure increases to 82%. Film is exposed by the radiation. The more radiation film is subjected to, the more exposed it becomes. Units of Radioactivity by Jessie A. Key is licensed under a Creative Commons Attribution-NonCommercial-ShareAlike 4.0 International License, except where otherwise noted.